Chemotherapy is one of effective methods for the treatment of tumor. Patients often develop drug resistance after chemotherapic cycles. Salmonella has potential as antitumor agent. Salmonella used in tandem with chemotherapy had additive effects, providing a rationale for using tumor-targeting Salmonella in combination with conventional chemotherapy. To improve the efficacy and safety of Salmonella, a further understanding of Salmonella interactions with the tumor microenvironment is required. The presence of plasma membrane multidrug resistance protein P-glycoprotein (P-gp) is highly relevant for the success of chemotherapy. Following Salmonella infection, dose-dependent downregulation of P-gp expressions were examined. Salmonella significantly decreased the efflux capabilities of P-gp, as based on the influx of Rhodamine 123 assay. In addition, Salmonella significant reduced the protein express the expression levels of phosph-protein kinase B (P-AKT), phosph-mammalian targets of rapamycin (P-mTOR), and phosph-p70 ribosomal s6 kinase (P-p70s6K) in tumor cells. The Salmonella-induced downregulation of P-gp was rescued by transfection of cells with active P-AKT. Our results demonstrate that Salmonella in tumor sites leads to decrease the expression of P-gp and enhances the combination of Salmonella and 5-Fluorouracil therapeutic effects. The proliferation of drug resistant tumor cells is believed to relapse in most patients after several cycles of chemotherapy. The growing evidences point out that the tumor microenvironment plays an important role in drug resistance . P-glycoprotein 1 (P-gp) is the multidrug resistance protein 1 (MDR1) or ATP-binding cassette, sub-family B member 1 (ABCB1). The P-gp is an important protein of the cell membrane that pumps chemotherapeutic drugs out of cells . Many tumors have higher levels of P-gp that correlates with drug resistance . Salmonella targets to tumor sites and arrests tumor growth [4, 5]. The combination of Salmonella and chemotherapy acted additively to delay tumor growth and prolong the survival time of tumor-bearing mice [5- 7]. Previously, we have shown that Salmonella increases the efficiency of cisplatin via enhancement of gap junction . Meanwhile, Salmonella can target to tumors and modulate numerous signaling pathways of tumor cells . We hypothesize that Salmonella not only enhances drug diffusion via upregulation gap junction, but also decreases drug efflux through downregulation P-gp. This study provides evidence for the mechanism of the regulation of P-gp by Salmonella and validates the incorporation of Salmonella as a novel therapeutic strategy against tumor. Salmonella enterica serovar choleraesuis (S. Choleraesuis; S.C.) (ATCC 15480) was obtained from Bioresources Collection and Research Center (Hsinchu, Taiwan) . B16F10 (mouse melanoma)  and 4T1 (mouse breast cancer)  cells were maintained in culture dish with Dulbecco's Modified Eagle Medium containing 1% antibiotics (100 units/mL penicillin and 100 μg/mL streptomycin), 2mM l-glutamine and 10% fetal bovine serum. Rhodamine 123 (Rho-123) and 5-Fluorouracil (5-FU) were purchased from Sigma Aldrich. Constitutively active AKT plasmid was kindly provided by Dr. Chiau-Yuang Tsai (Department of molecular immunology, Osaka University) . Cells were treated with plasmids for 16 h in serum free medium prior to adding Salmonella (multiplicity of infection (MOI) = 10) into cells for 90 min. C57BL/6 (B16F10 mouse tumor model) and BALB/c (4T1 mouse tumor model) female mice were purchased from the National Laboratory Animal Center of Taiwan. The animals were maintained in a pathogen-free animal care facility in isothermal conditions with regular photoperiods. The experimental protocol adhered to the rules of the Animal Protection Act of Taiwan and was approved by the Laboratory Animal Care and Use Committee of the National Sun Yat-sen University. Bicinchoninic acid (BCA) protein assay (Pierce Biotechnology, Rockford, IL, USA) was used to determine the protein content in each sample. Quantified each sample concentration to 60-80 µg and proteins were fractionated on SDS-PAGE, transferred onto Hybond enhanced chemiluminescence nitrocellulose membranes (Amersham, Little Chalfont, UK) and detected with antibodies against P-gp (GeneTex, Inc. Irvine, CA, USA), the mammalian target of rapamycin (mTOR) (Cell Signaling, Danvers, MA, USA), phosph-mTOR (Cell Signaling), protein kinase B (AKT) (Santa Cruz Biotechnology, Inc. Santa Cruz, CA, USA), phosph-AKT (Santa Cruz Biotechnology, Inc.), p70s6K (Cell Signaling), phosph-p70s6K (Cell Signaling), caspase 3 (Cell Signaling), β-actin (Sigma Aldrich). Rabbit anti-mouse IgG-peroxidase antibody (Sigma Aldrich) and goat anti-rabbit IgG-peroxidase antibody (Sigma Aldrich) were used as the secondary antibody and protein-antibody complexes were visualized by enhanced chemiluminescence system. The Western blotting signals were quantified with ImageJ software (rsbweb.nih.gov/ij/) [14, 15]. B16F10 or 4T1 cells were plated in 12 well culture plates for 24 h, and treated with various MOI of Salmonella for 4 h. The cells were washed with PBS and added the antibiotic medium. Retention of Rho-123 was measured to evaluate P-gp functional activity in B16F10 and 4T1 cells. Intracellular Rho-123 was determined from the fluorescence (Ex. 530nm Em. 590 nm) by spectrometer (BMG Labtech, Headquarters Germany). The accumulation of Rho-123 in cells was also analyzed using a fluorescence microscope. Cell proliferation was assessed by the colorimetric WST-8 assay (Dojindo Labs, Tokyo, Japan) according to the manufacturer's instructions . Mice were inoculated subcutaneously (s.c.) with 106 B16F10 or 4T1 cells at day 0, and at day 7 nodules developed at all injection sites with approximately tumor volume of 80 mm3. Groups of tumor-bearing mice were injected intraperitoneally (i.p.) with Salmonella 2 ×106 colony-forming units (cfu) at day 7 followed by 5-FU (40 mg/kg) treatment on days 9, 11, and 13, or with either treatment alone. All of the mice were monitored for tumor growth as previously described . The ANOVA was used to determine differences between groups. Any P value less than 0.05 is regarded statistically significant. To analysis whether Salmonella could regulate P-gp transport activity after Salmonella infection in tumor cells, the intracellular accumulation of Rho-123 was assessed. The P-gp functionality was measured by detecting the intracellular accumulation of fluorescent (Rho-123). As shown in Fig. 1A, Rho-123 was detected modestly at the nuclear periphery and in the cytoplasm in control cells, whereas it was detected exclusively in the cytoplasm in the cells treated with Salmonella. We also observed the similar phenomenon in B16F10 cells (Fig. 1A). By measuring the fluorescence values, the accumulation of Rho-123 was significantly more in the Salmonella-treated cells than that in the control cells (Fig. 1B). These results show that Salmonella increases the accumulation of Rho-123, indicating that Salmonella suppresses P-gp transport activity. Rhodamine 123 (Rho-123) accumulation in B16F10 and 4T1 cells treated with Salmonella (S.C.). B16F10 and 4T1 cells were infected with S.C. for 4 h, washed and incubated with culture medium for 2 h prior to addition of Rho-123. (A) The accumulation of Rho-123 in cells was analyzed using a fluorescence microscope. (B) The Rho-123 were determined from the fluorescence by using spectrofluorometer. ** P< 0.01; *** P<0.001. Salmonella (S.C.) regulated the expression of P-glycoprotein (P-gp), and AKT/mTOR signaling pathway. The expression of P-gp, AKT, mTOR, p70s6K was measured in B16F10 (A) and 4T1 (B) cells by Western blotting analysis. The β-actin expression served as loading controls for and total protein. Each experiment was repeated three times with similar results. To gain insights into the role of P-gp on Salmonella infection, we used Western blotting analysis to study the correlation between P-gp and Salmonella infection. Fig. 2 shows that the protein levels of P-gp were decreased in Salmonella-treated tumor cells. Furthermore, the AKT /mTOR signaling pathway can promote P-gp protein synthesis through phosphorylation of p70s6K [17, 18]. In dose dependent manner, Salmonella significantly reduced the phosphorylation of AKT, mTOR, and p70s6K in B16F10 and 4T1 cells (Fig. 2). These results suggest that reduction of P-gp expression in tumor cells was associated with inhibition AKT/mTOR/p70s6K signaling pathway during Salmonella infection. Furthermore, we examined the downregulation of P-gp expression by Salmonella infection upon the sensitivity of the tumor cells to killing by 5-FU that induce cell death. Herein, the proliferation of tumor cell was measured after 5-FU, Salmonella or Salmonella combined with 5-FU treatment. The results show that the amounts of tumor cells were lowest when tumor cells were treated with Salmonella combined 5-FU (40 μM) compared with the control group (Fig. 3A and C). Treatment with 5-FU significantly enhanced cell death in Salmonella-infected cells as compared to uninfected cells. Meanwhile, we also observed that Salmonella and 5-FU increased the apoptosis marker (cleaved caspase 3) (Fig. 3B and D). Collectively, these results indicate that Salmonella may inhibit the proliferation of tumor cells through the enhancing susceptibility of tumor cells to 5-FU. Consequently, we next examined the extent to which changes in P-gp expression contributed to the Salmonella-inhibited AKT/mTOR/p70s6K signaling pathway. By transfecting constitutively active AKT plasmid, the AKT/mTOR/p70s6K signaling pathway can be reversed . Salmonella did not inhibit the constitutively active AKT. As shown in Fig. 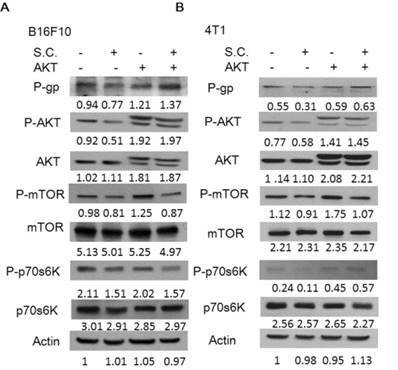 4, Salmonella lost the ability to suppress the expression of the P-gp through downregulation AKT/mTOR/p70s6K signaling pathway after transfecting constitutively active AKT plasmid. The similar results were also observed in the expression of cleaved-caspase 3 in the B16F10 and 4T1 cells treated with 5-FU in combination with Salmonella. 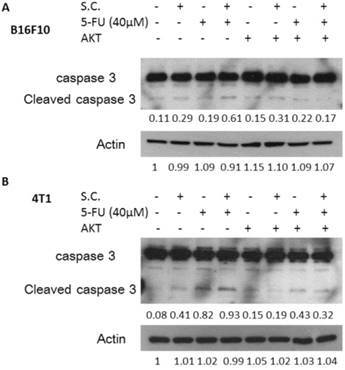 After transfecting constitutively active AKT plasmid in two tumor cells, the expression of cleaved-caspase 3 was reduced after the combo therapy (Fig. 5). The results demonstrate that downregulation AKT/mTOR signaling pathway is necessary for Salmonella-reduced P-gp expression in tumor cells. Salmonella (S.C.)-regulated P-glycoprotein (P-gp) expression in conjunction with 5-FU exerted cytotoxic effects on B16F10 and 4T1 cells. Salmonella-treated (MOI=10), or control cells were exposed to 5-FU (0-40 μM) for 48 h followed by determination of their viability by the WST-8 assay in B16F10 (A) and 4T1 (C) cells. Data are expressed as mean ± SD of hexaplicate determinations. 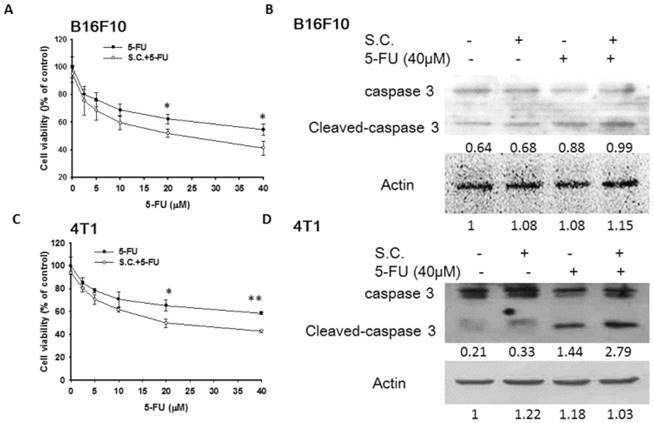 Salmonella-treated (MOI=10), or control cells were exposed to 5-FU (40 μM) for 48 h followed by determination of caspase 3 expression by the Western blotting analysis in B16F10 (B) and 4T1 (D) cells. Multiplicity of infection (MOI). * P<0.05. Constitutively active-AKT reduced the effects of Salmonella (S.C.). The B16F10 and 4T1 cells were transfected with constitutively active AKT plasmid (5 μg) for 16 h prior to treatment with Salmonella (MOI = 10) or not for 4 h. The expression of P-glycoprotein (P-gp), AKT, mTOR, p70s6K protein in B16F10 (A) and 4T1 cells (B) was determined. The β-actin expression served as loading controls for and total protein. Each experiment was repeated three times with similar results. Constitutively active-AKT decreased the effects of Salmonella (S.C.) in combination with 5-FU. The B16F10 and 4T1 cells were transfected with constitutively active AKT plasmid (5 μg) for 16 h prior to treatment with Salmonella (MOI = 10) or not for 4 h. Salmonella-treated (MOI=10), or control cells were exposed to 5-FU (40 μM) for 48 h followed by determination of caspase 3 expression by the Western blot analysis in B16F10 (A) and 4T1 (B) cells. Multiplicity of infection (MOI). Additive antitumor effects of Salmonella (S.C.) in combination with 5-FU on subcutaneous B16F10 and 4T1 tumors. Groups of 8 mice that had been inoculated s.c. with B16F10 (a) and 4T1cells (b) at day 0 were treated i.p. with Salmonella (2 × 106 cfu) at day 7 followed by 5-FU (40 mg/kg) treatment at days 9, 11, and 13, or with either treatment alone. Vehicle control mice received PBS. Tumor volumes (mean ± SEM, n = 8) among different treatment groups were compared in mice bearing tumors. * P<0.05. The tumor growth of the mice bearing B16F10 or 4T1 tumors was evaluated the antitumor effects of Salmonella. As shown in Fig. 6 A and B, Salmonella significantly inhibited tumor growth in comparison with that in PBS-treated control mice. The low-dose 5-FU did not show significant antitumor activity. As expected, the combination therapy of Salmonella and 5-FU enhanced the antitumor activity. In B16F10 and 4T1 tumor model, the tumor volume of mice treated with the combination therapy reduced by 37.7% and 51.67% compared with those in the Salmonella-treated group, respectively. Taken together, Salmonella alone could reduce tumor growth in murine tumor models. Furthermore, the combination therapy had the additive antitumor effects. The effects of the combinational treatment of 5-FU and Salmonella in vitro and in vivo were determined by using mouse melanoma and breast tumor models. The combination of Salmonella and 5-FU inhibits tumor growth and tumor size compared to 5-FU alone, suggesting that Salmonella can increase the efficacy of 5-FU. However, the detailed mechanism of the combinational therapy remained uncertain. In this study, we used mouse tumor models to determine the mechanisms of Salmonella-induced signaling and the consequences of the combination therapy. Salmonella was demonstrated the ability to decrease the expression of P-gp through posttranscriptionally regulated . Some studies also demonstrated downregulation of p-gp expression via inhibition of AKT/mTOR pathway . There is a growing evidence that an increase in chemotherapy-mediated response to P-gp downregulation . There is extensive literature of tumor-targeting Salmonella increasing the efficacy of chemotherapy [21-24]. Salmonella recruited peripheral immune cells to the tumor by upregulating interferon γ and T cells are also involved in the modulation of Salmonella-induced host immunity [25, 26]. Thus, some studies may suggest that tumor necrosis factor α is response for main cells infiltrating Salmonella-treated tumors . Salmonella has been used as an antitumor agent that specifically proliferates within tumors and inhibits their growth . In addition, Salmonella cannot disperse throughout the tumor and this is the disadvantage for its use as an anticancer agent . Our previous studies suggested that Salmonella disperses within tumors and inhibits tumor growth when combined with chemotherapy [7, 8]. There is a significant increase of apoptosis in 5-FU-treated cell. Cell proliferation analysis and Western blotting assay showed a significant increase in cell death of Salmonella combined with 5-FU treated tumors compared to control. Downregulation of P-gp may allow high intracellular cytotoxic drug concentrations in tumor cells. The P-gp expression in tumor cells may influence the clinical response to chemotherapy. To show the results, Salmonella manipulate P-gp in conjunction with 5-FU treatment may provide new insights for tumor therapy. The 5-FU is one of the most commonly used drugs to treat cancer including breast, colon and some skin cancers. Therefore, the major limiting factor in the use of 5-FU is the side effects in normal tissue including diarrhea, month ulcers, and hair thinning. This would allow the use of lower 5-FU concentration, thus decreasing the side effects. Salmonella provides to accelerate cell death in tumor cells while decreasing P-gp expression. Recent studies revealed that resveratrol decreases in P-gp expression is regulated by AKT/mTOR signaling pathways . Previously, we demonstrated that AKT/mTOR signaling is involved in the cell-defense elimination of Salmonella. 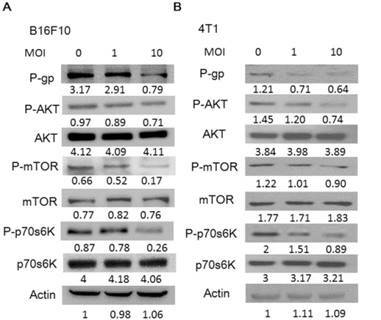 The AKT/mTOR signaling pathway negatively regulates some protein syntheses that are critical for tumor cell survival [11, 16]. We determined that the levels of phosphorylated AKT, mTOR, and p70s6K were significantly decreased in Salmonella-treated cancer cells. Herein, we investigated the effect of Salmonella on P-gp expression and function. We found that Salmonella-inhibited activation of AKT/mTOR pathway and are thought to play an important role in the downregulation of P-gp. By using of the cytoxicity effect of 5-FU and the pleiotropic activities of Salmonella, we suggest that Salmonella combining with 5-FU appears to aim at reversing cancer drug resistance. P-gp: P-glycoprotein; P-AKT: phosph-protein kinase B; P-mTOR: phosph-mammalian targets of rapamycin; P-p70s6K: phosph-p70 ribosomal s6 kinase; 5-FU: 5-Fluorouracil; Rho-123: Rhodamine 123: MDR1: multidrug resistance protein 1; ABCB1: ATP-binding cassette, sub-family B member 1; S.C.: Salmonella enterica serovar choleraesuis (S. Choleraesuis). C.J.Y. and C.H.L conceived and designed the experiments; C.J.Y, W.W.C, S.T.L. and M.C.C. performed the experiments; C.J.Y. and C.H.L analyzed the data; C.H.L contributed reagents/materials/analysis tools; C.J.Y. and C.H.L wrote the paper.